Training pharmaceutical sales representatives is one of the most important success factors for pharma companies. Pharmaceutical sales representatives need to be trained to acquire knowledge on their company’s products. While there are other methods of training, pharma companies are greatly heading toward e-learning due to the fact that e-learning is effective and that a learner can take up the course anytime, irrespective of their schedule. We recently worked on an e-learning project for one of the pharmaceutical companies that wanted to train their sales representatives on their products. 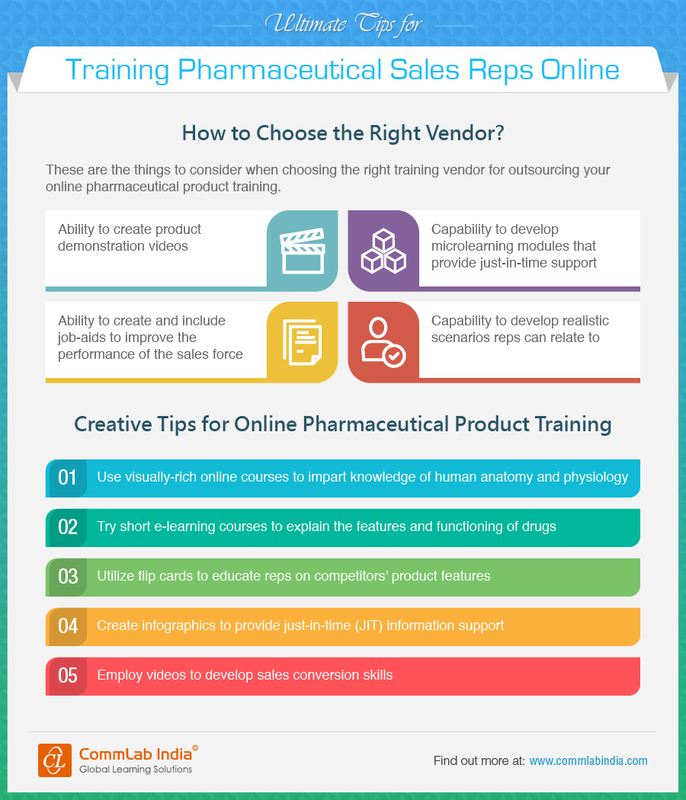 In my blog today, I want to discuss a few approaches that we have taken while developing the online course for Pharma sales representatives. A curriculum-based approach: The course material that we received was too vast and data-heavy. It comprised of the anatomy of the organs, diseases relating to organs and how their product would help treating the disease. Realizing the fact that such a data-heavy content could overwhelm the learners, we decided to follow a curriculum-based approach. We decided to break the content into three separate and concise learning modules: one module explaining the organ and its anatomy, the second module explaining the diseases related to the organ and the third module about the drug used in treating the disease. In this manner, we could give each learning module a proper structure and framework. Each learning module had its own learning objectives that learners needed to achieve. A retention and recall approach: Each module in the curriculum-based course was interrelated to each other. Hence, it was important for learners to take on each learning module in order to have a big picture of the overall e-learning course. For this, we included a ‘Do you know’ or a ‘Can you recall’ question section. In the first module, we asked a basic question as a ‘Do you know’ relating to the organ of the body. In the next module, we used a ‘Can you recall’ question that was related to the previous module. This helped learners to recall what they have studied in the previous module. This approach was also helpful in a way that learners could relate the content of the present module with that of the previous module. For example, in the module explaining about the drug, we asked learners to recall the symptoms of the disease for which this drug could be used. We then explained how the drug would help in the treatment of disease. Take a look at the screenshot. 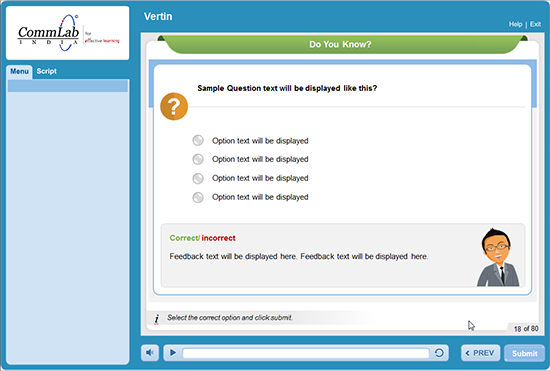 A scenario-based approach: The main objective of an e-learning course is that when learners take the course, they become well versed and they can apply the knowledge gained in their respective workplaces. For a pharmaceutical sales representative, he needs to have an overall understanding of the product. He needs to talk to doctors or pharmacists in order to promote the product and achieve higher sales. 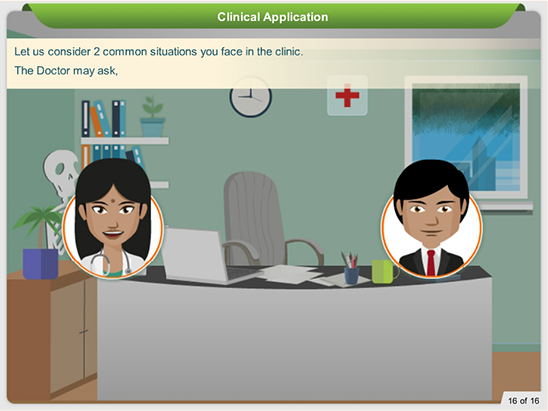 One of our approaches was to include a scenario in which a pharmaceutical sales representative was shown talking to a doctor and explaining the importance of the drug he was selling. This approach was very effective as the learners were able to emotionally connect themselves with the course and pursue the course with great enthusiasm. Take a look at the screenshot below. This was the approach that we followed in our e-learning course and it turned out to be an effective one. Do share your ideas and views on this subject.